The Event Management module owes its good functioning to the correlation engine integrated into the module. The following article explains the various configurations to apply to better exploit the offered features. The role of the correlation engine is to transform received email messages into events, to associate the right CI in cause, to define its categorization, to automatically create an incident if the conditions are met and to try to determine from a list of affected CI, the probable cause of failure. Destined to determine the periods while the CI must be functional. The correlation engine will create an incident if an outage is signaled during the service range. The correlation engine will continue to monitor the outage until the CI goes into its service range (causing the incident creation) or until the surveillance system indicates that it went back to normal. 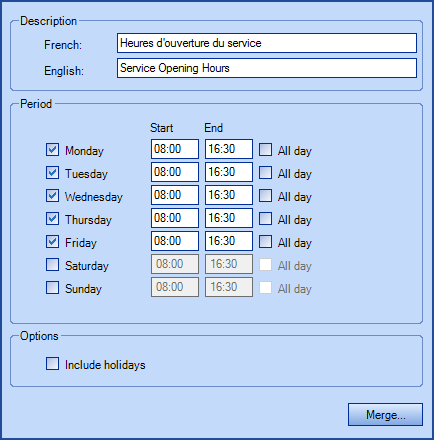 The service range are defined in the Tools > Reference Data Management… > CI > Time Range menu. Once the service range is configured, each monitored CI will need a service range. Allows to identify the group or the assignee responsible for the maintenance of the CI type. The configuration of the person in charge of the maintenance is done through Tools > Reference Data Management… > CI > your CI type > Maintenance tab. The correlation engine will assign generated events and incidents to the group responsible for the CI. Each CI will inherit configurations for his type, but it could also be defined directly in its file. When multiple events are generated, the correlation engine will try to determine the source cause by looking at existing relationships between CI. For the correlation engine to follow a relation, it must be identified as "Required to operate". To reverse the relationship, click on the red and green arrows icon. The configured equipments and CI in your surveillance system must have identical names to be recognized by Octopus. The correlation engine must be able to follow an established relationship in Octopus to determine the source of a failure. Relationships must be established the same direction than the one your surveillance system can observe. Being used to identify events containing factual data not requiring any immediate or long term action. Events of this type are automatically marked as Processed. Being used to identify events containing status warnings, without being exceptions, that could require some evaluation or monitoring by an assignee without becoming an incident. These events must be treated manually. Being used to identify events requiring an immediate processing (in form of an incident) from the person/group responsible of the CI maintenance. At the incident creation, the system automatically links the event to the incident, and any other event that could apply. The correlation engine will do a surveillance of the outages return. The categorization is used to regroup events of the same type to facilitate the sorting of the work needed to be done, or data to analyze in a report. Once the categories created through the menu Tools > Reference Data Management... > Event > Categories, they will become available for selection from a drop-down list at the creation or modification of events. 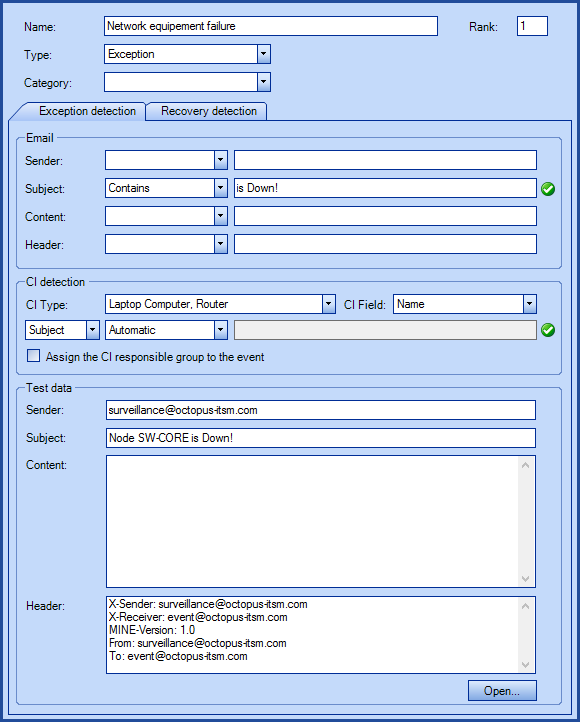 The email address used to receive notifications from the surveillance system will be indicated in the Source field. A processing rule requires at least a name, a type and a criterion. If multiple rules of the same rank have overlapping criteria, an event without categorization will be created. Octopus allows, for the same Outage rule, to follow both outage events than recovery detection. The Recovery detection tab contains the same features than the outage detection tab. 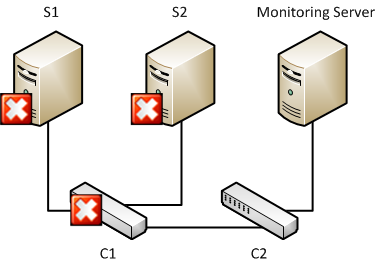 The surveillance system detects that two servers (S1, S2) and a switch (C1) have a failure. It sends the appropriate outage alerts. To be able to make the correlation of the incidents, the engine waits a certain time from the reception of the first outage email before creating the incident. You must configure the creation delays in the options, taking in consideration the time required by your surveillance system. If multiple exception events are received during the delay and that it is impossible to link them, a new incident will get created for each single event. If you have configured a threshold for single events and that it has been reached, only one incident will get created. The incident will get assigned to the assignee group common to all CI, otherwise the system will use the responsible default group configured in the options.